The Nightmare Ground for me: Eslington Tower looking as eerie at dusk (left) as the Eskdale Main Corridor did c 1910. 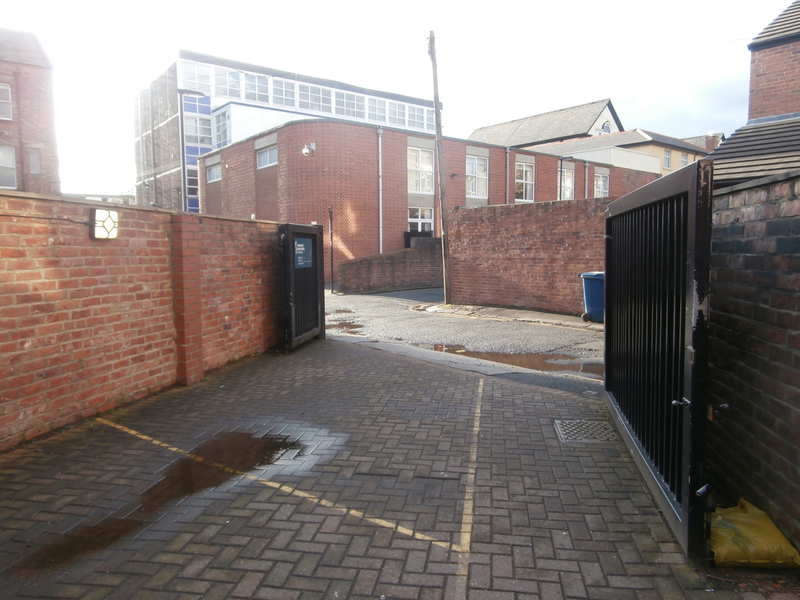 I had to traipse along this dreary lane, heavy bag in one hand and laptop tucked under my other arm, numerous times each day for two years – hail, rain or shine. My ex-Church High colleague, Kay, always referred to Eslington as ‘Fagin’s Den’, so clearly it wasn’t just me who found it a depressing place to work. I’m sure the property was once a very fine house, but it was dark and dank, particularly at ground floor level, and more than one cleaner confided they didn’t like being in that building alone. A make-shift Home Economics room had been created on the top floor, where Church High colleague Lynn Batchelor was based. Lynn’s smile was the brightest thing in the building. It helped a lot. 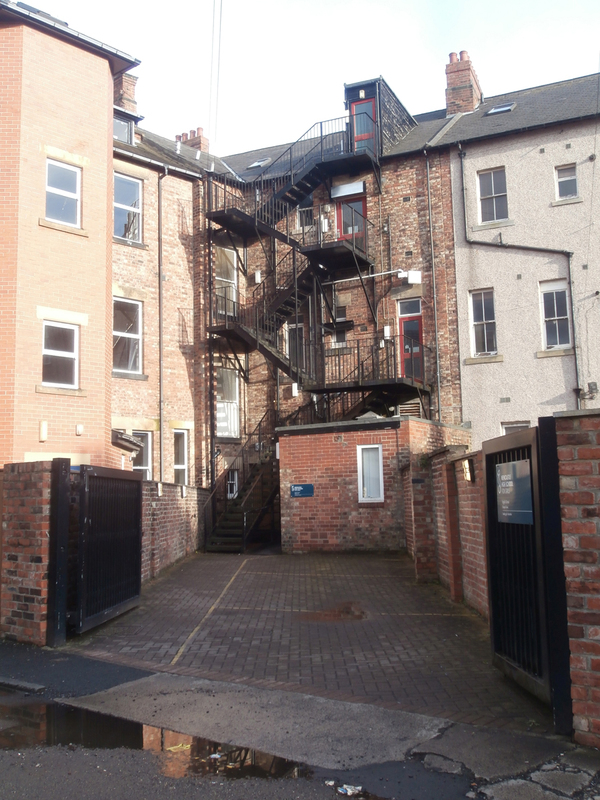 The ugly black fire-escape which dominated the back elevation prompted me more than once wryly to liken our existence there as being akin to ‘Westside Story – but without the singing and dancing’! Eslington Entrance reminiscent of Fagin’s Den. So let me show you round my teaching world for the second year in Eskdale. Those of you who remember sunny, ivy shrouded Room 5 will see – all too clearly – why I was never at home there. 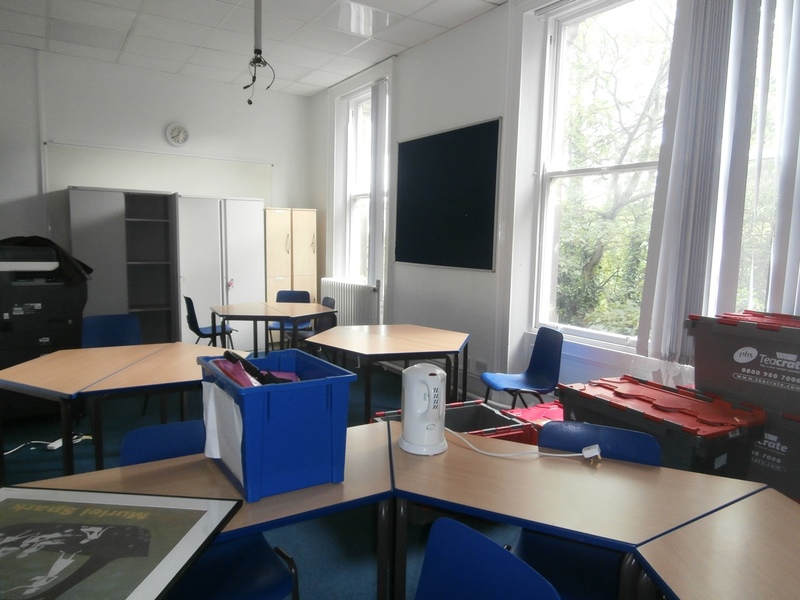 However, at the time I was grateful for the hard-won room base having had to teach my lessons for the entire first year of NHSG in 13 different classrooms, spread out across 4 separate buildings (whilst others in the department enjoyed the luxury of a dedicated teaching room). Not an ‘even’ battlefield – sorry, playfield – right from the very start. 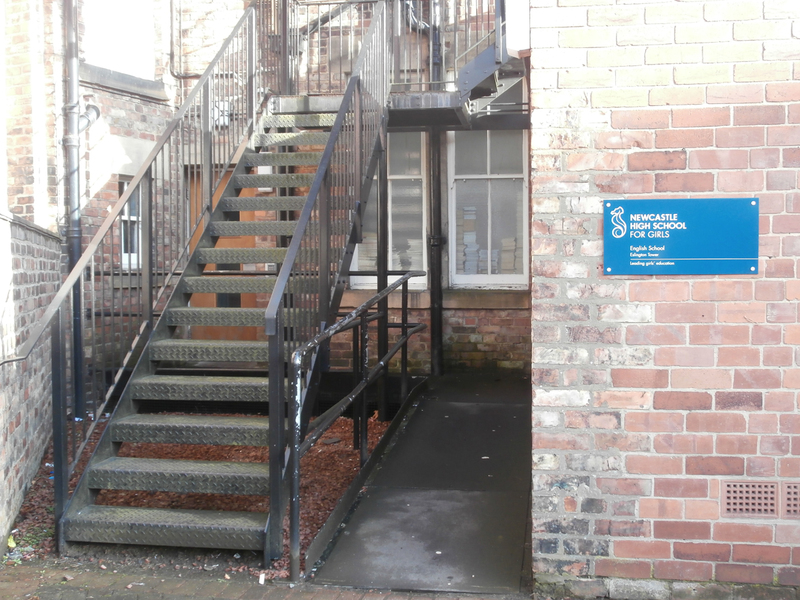 The ‘welcoming’ main entrance of the NHSG English School. The dark & dingy hallway: ET2 is to the left. 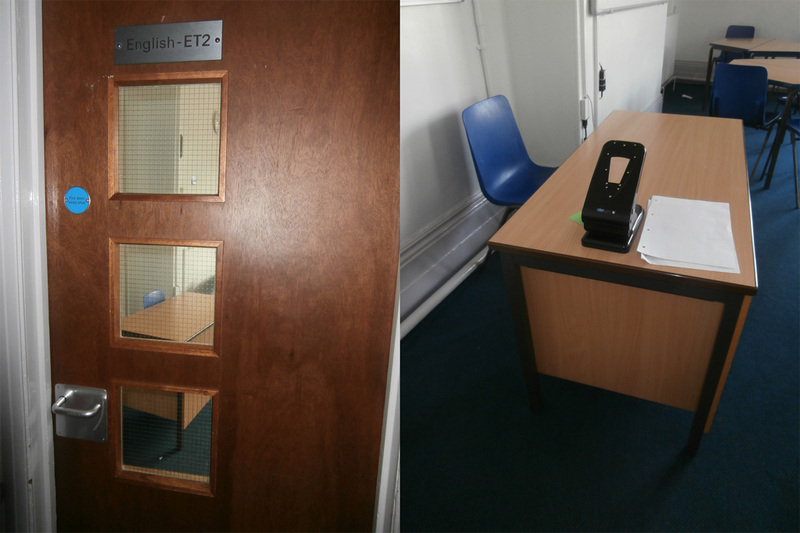 ET2’s door (left) opened virtually directly onto the teacher’s desk. It was always a very tight squeeze to get into the room. 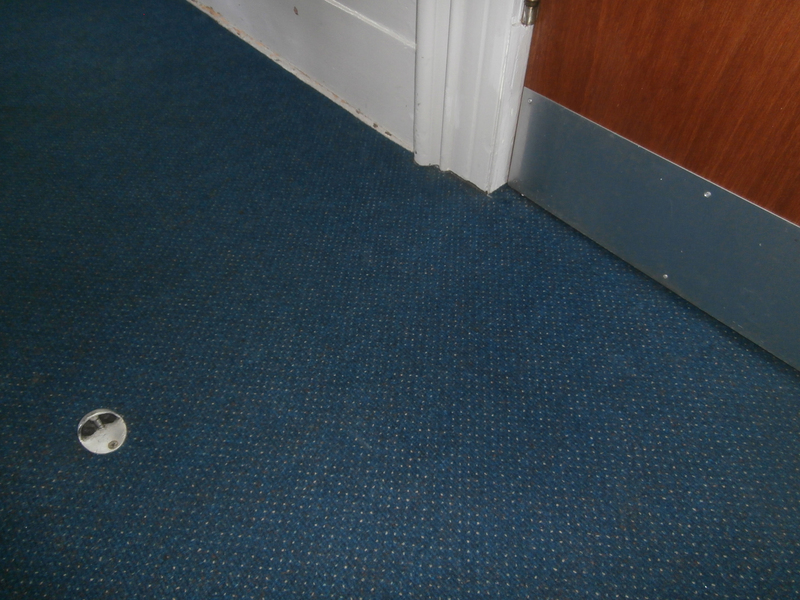 I wish I had a fiver for every time I (or a pupil) tripped over or stubbed a toe on that inconveniently placed doorstop …. …. 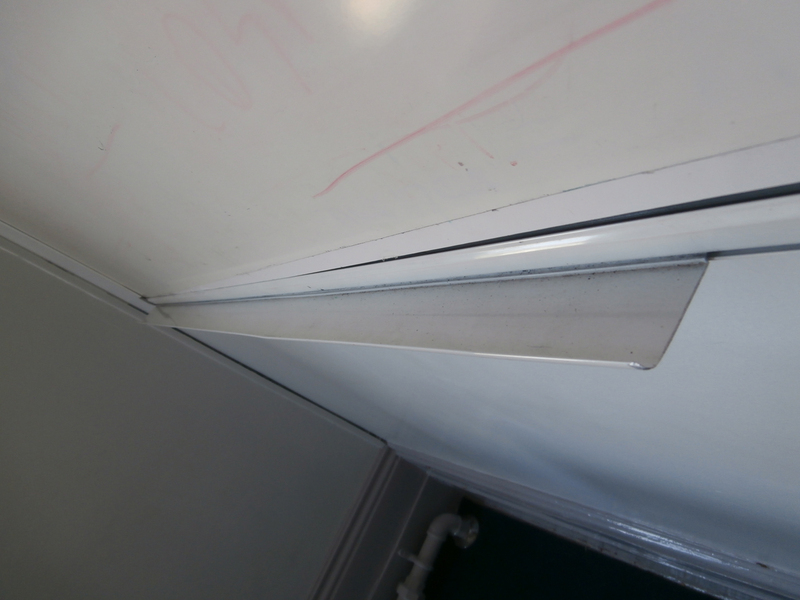 or scraped an arm/snagged clothing on this sliding piece of jutting out plastic! (The light fitting which fell down during one of Ruchelle Everton’s lessons was never replaced). The only feature of the room which gave ET2 any character was the big bay window (part of the tower) to the left of the teacher’s desk. In case I was ever in danger of forgetting the fact time in Eslington was finite, from April a ‘For Sale’ sign was always in my eye-line. From April, I had a ‘For Sale’ sign constantly in my eye-line. The Eslington room I found the most uncongenial was on the first floor and was used as a departmental staffroom. The summer we moved down from Church High, I really did have high hopes for this room. Leaf-dappled sunlight filtering in through the branches of a large tree in the garden was faintly reminiscent of Church High. I pinned some RSC posters to a section of noticeboard in an attempt to settle in. The writing was on the wall the day I noted random documents pinned onto these posters with drawing pins, however. At the end of that day I went across after school and removed all my pictures. It goes without saying that room was never a ‘home’ to me. Department meetings were held there around an octagonal table. I never ever got used to sitting at low children’s tables. 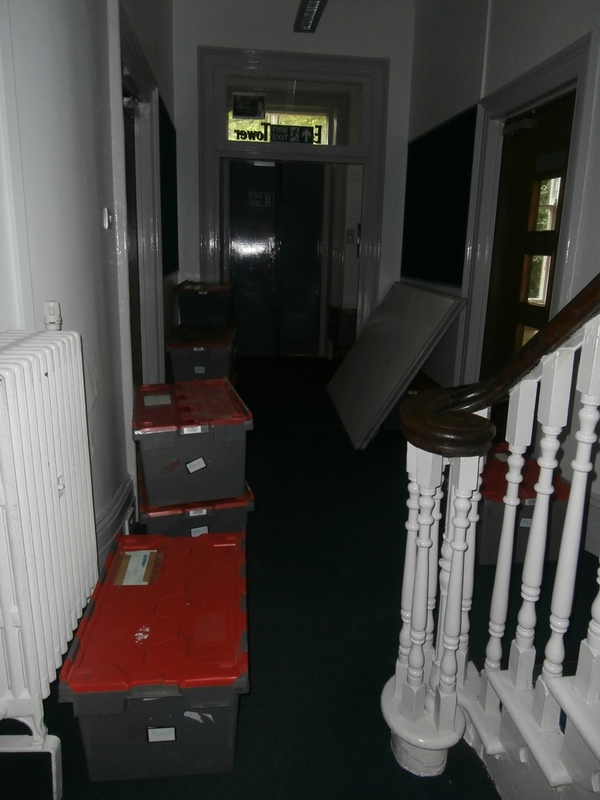 If anything, the return walk back across to the Eskdale building was even less picturesque. 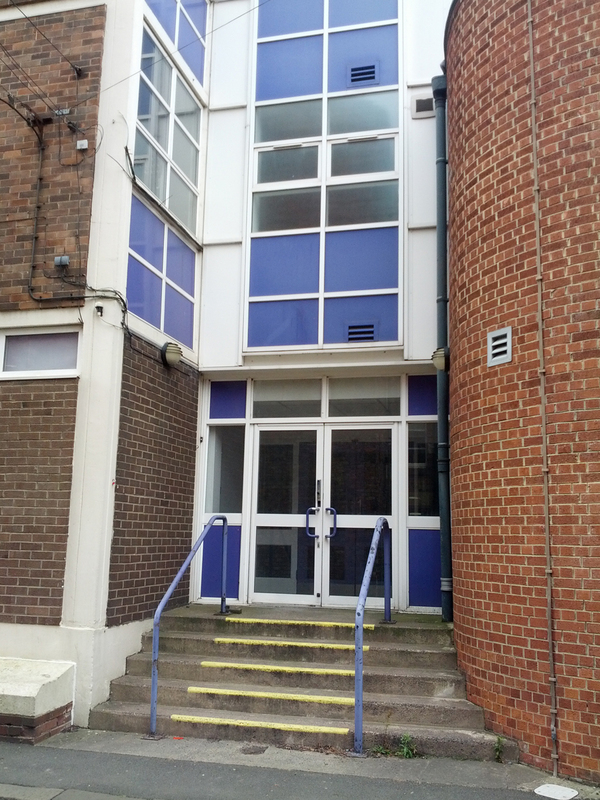 The heavy metal plated floor at the base of the fire-escape moved and clunked underfoot when you walked out onto it and to enter the main building again you had to run the gamut of the most purple-looking doorway in the whole school. The bottom corridor always smelled strongly of disinfectant, especially in the mornings. This made it feel more like a hospital than a school. 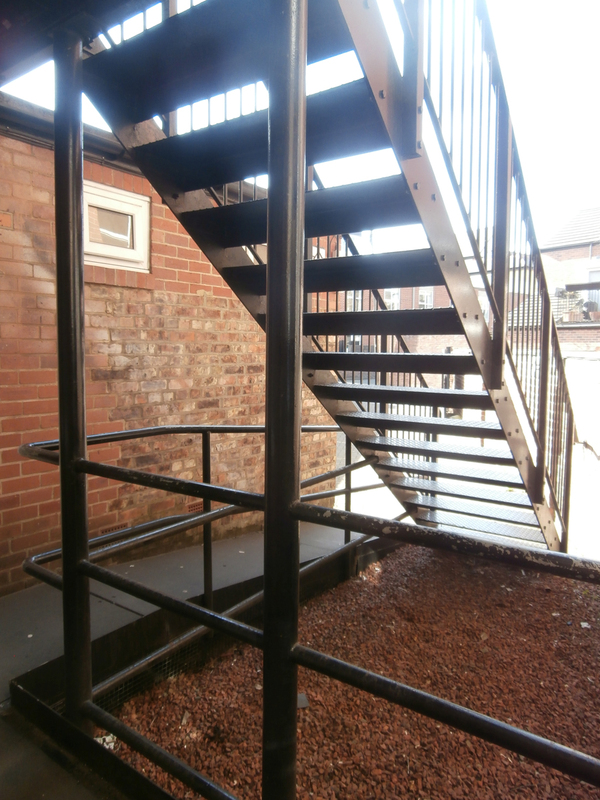 The view under the clunking metal fire-escape. My very last journey back across the Eslington back-yard…. 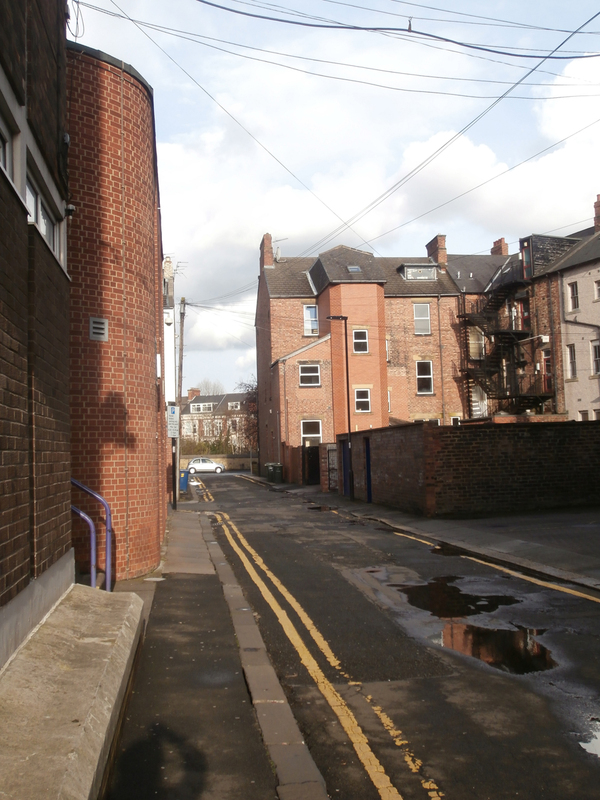 ….. and the uneven, badly-rutted back-lane which was lethal during the winter because it was never salted. Never in Gentian’s day! I know I wasn’t alone in hating the side door. No, going over ‘nightmare ground’ again is never an easy thing to do. The fact it has taken me well over a month to complete this particular post clearly reinforces this too. Sorry for the long delay. Hopefully ‘normal service’ will be resumed again soon. I could have skipped on, I know, and missed out this bit of the story. 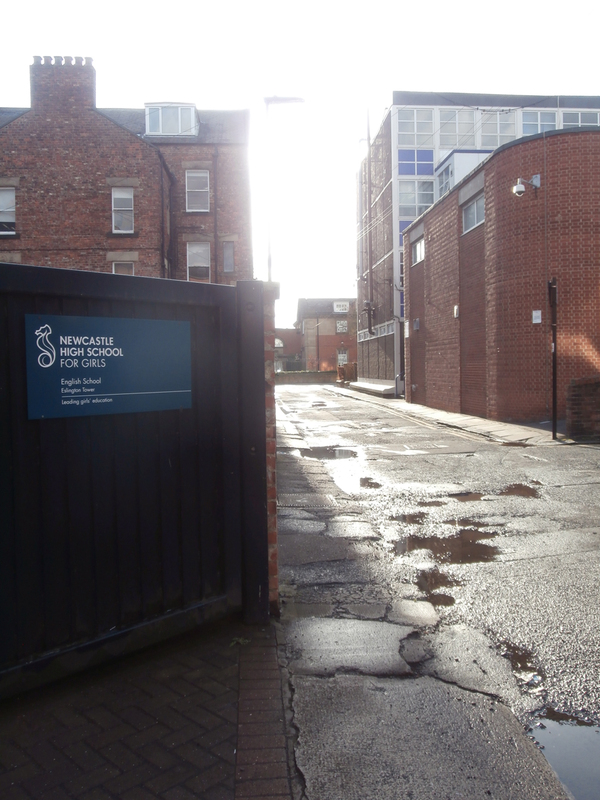 But my intention has always been to print all the posts off once our tale has come ‘full circle’, have them bound into a hard-backed volume and deposit the book with Tyne & Wear Archives for filing in the transitional NCHS/NHSG archive they have already put in place. But the delay has had one benefit though. I can now end my post on a therapeutic note. In the interim, workmen have moved in. Karma. The back of Eslington Tower has looked very different of late. 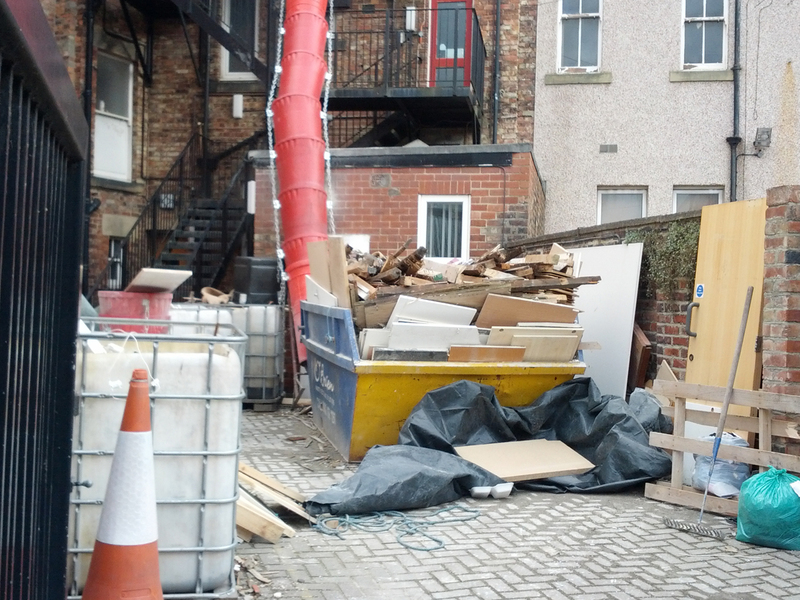 Rubbish removal in progress! 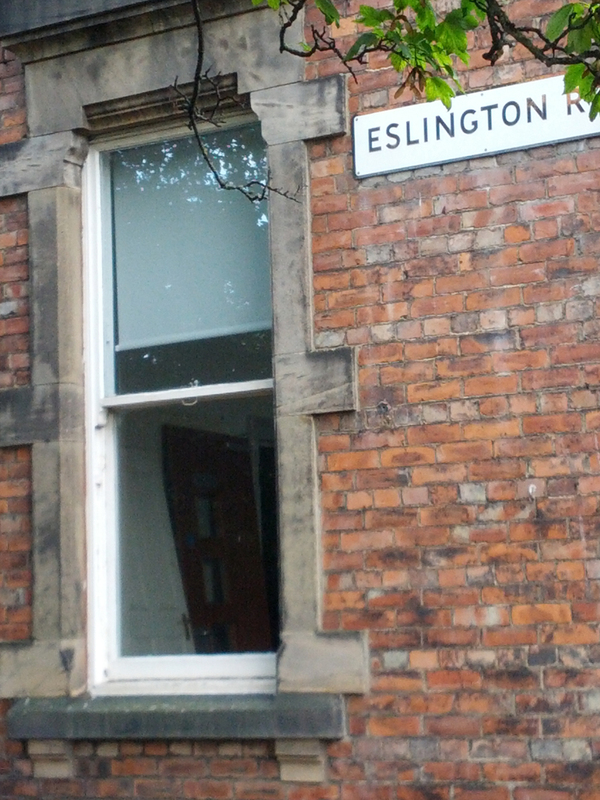 On my way home from work on September 8th this year, I caught a glimpse of something red out of the corner of my left eye as I was about to cross over the back lane behind Eslington Terrace on my way to Jesmond Metro. 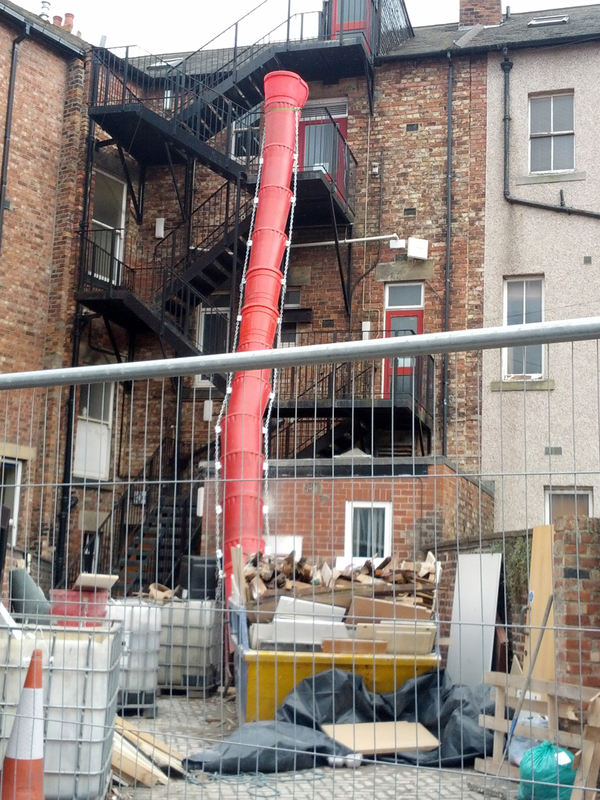 Curious, I made a little detour along that awkward little back lane one more time and spied the rubbish chute. 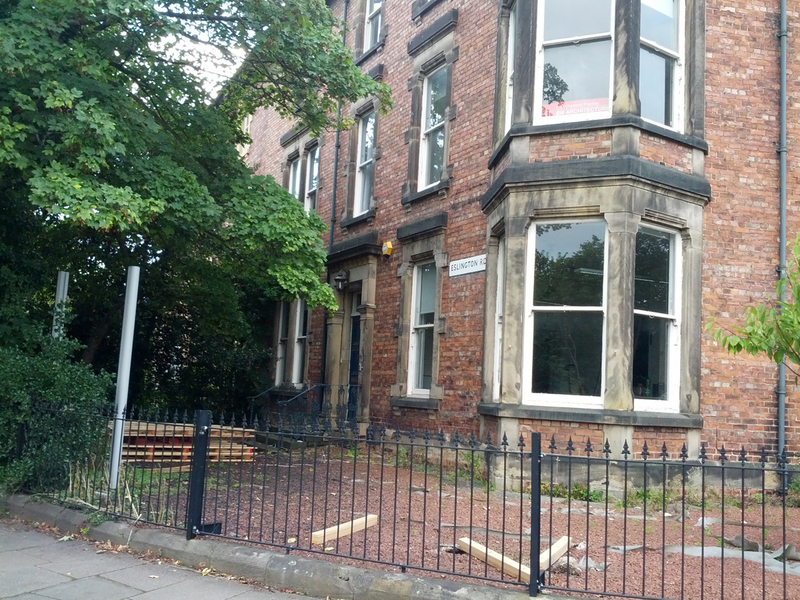 Not only is girls’ education in Jesmond finally back on Tankerville again, a new chapter is about to start for the Eskdale buildings too. I realise this will create sadness for those who loved their time at that school. But not for me. And I know others who feel the same. 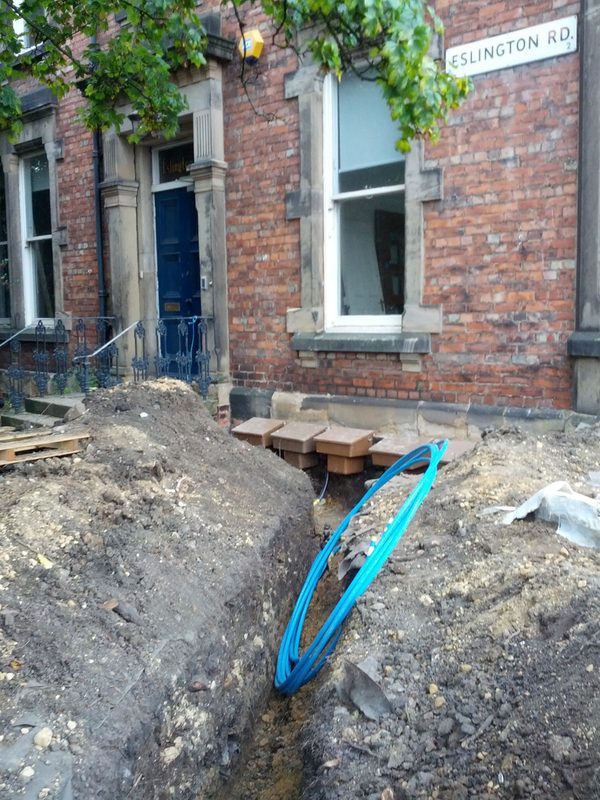 Eslington strip-out is well underway: I recognise that door! Once I got round the front of the building, there were indications a full ‘strip-out’ was in progress there too. The For Sale sign was no longer there. The Newcastle High School for Girls sign also. And through the window of ET2, I could see the door was off its hinges. No NHSG signage out front anymore: time is on the move. The door to ET2 will bother nobody anymore. And out front a couple of weeks later again. Doors are such symbolic things, aren’t they? Yes, the Roman god Janus sits double-faced in the New Year doorway with good reason. God of gates and transitions, he looks to both the past and future. Every ending is another beginning, of course, and so life continues its cycles and circles. 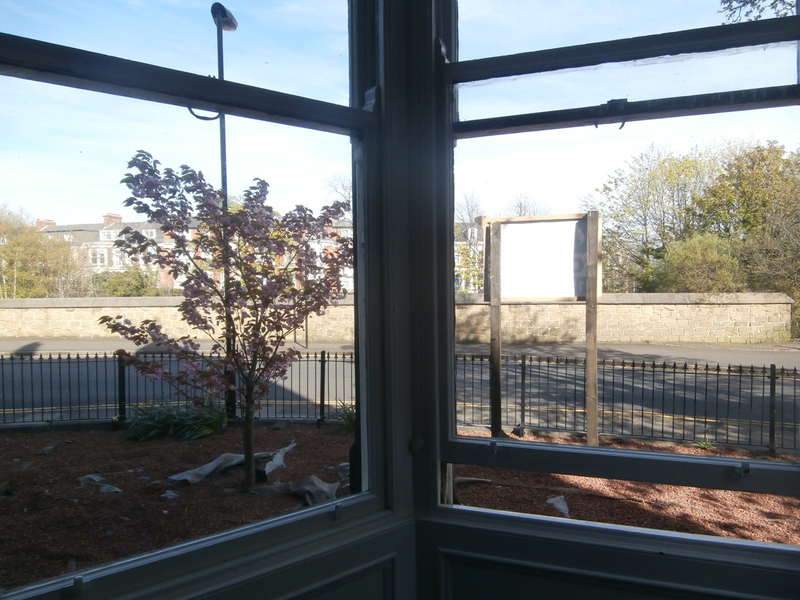 How different the feelings now on spying that troublesome ET2 door through a very dusty window, to seeing Giuseppe’s photo of a Church High door on a skip two years earlier. 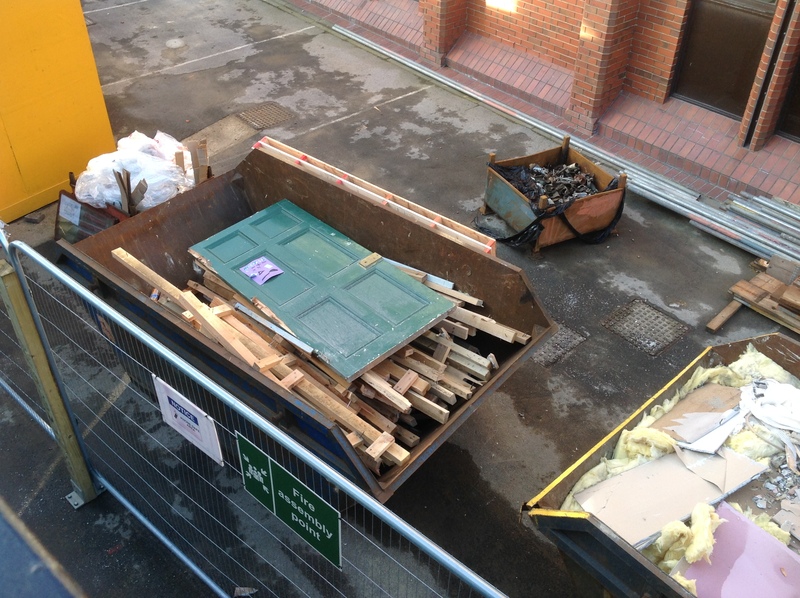 The first green door on a skip was a sign of the end in 2015. There are a lot of things I understand better now than in 2014. Back then we thought it was just the Church High history that wasn’t being given a ‘look in.’ Now I know it is just past history ‘full stop.’ That was made concrete clear walking round the front of Tankerville on September 8th. Something caught my eye. To the right this time. Something low down, gold and gleaming in the dusky evening light. Something gleaming at the base of the tree. Even though I’d worked the truth out a long time ago, I still couldn’t quite believe it when I saw what had drawn my eye to the foot of the tree. 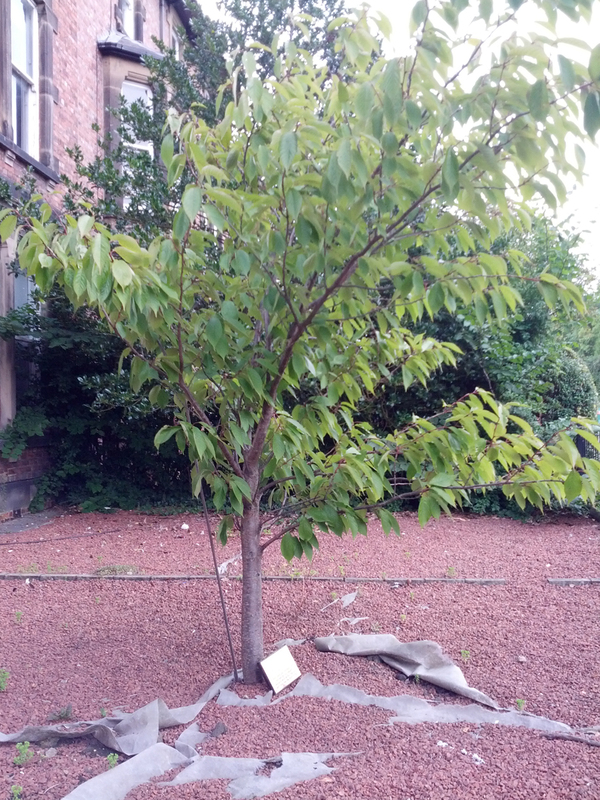 I’d learned the cherry tree outside my classroom window was a special little tree, planted in memory of a pupil who had died. An attempt had been made to move it, but, instead, a cutting was ultimately taken. Fair enough, I guess. Some things are probably best left as they are. 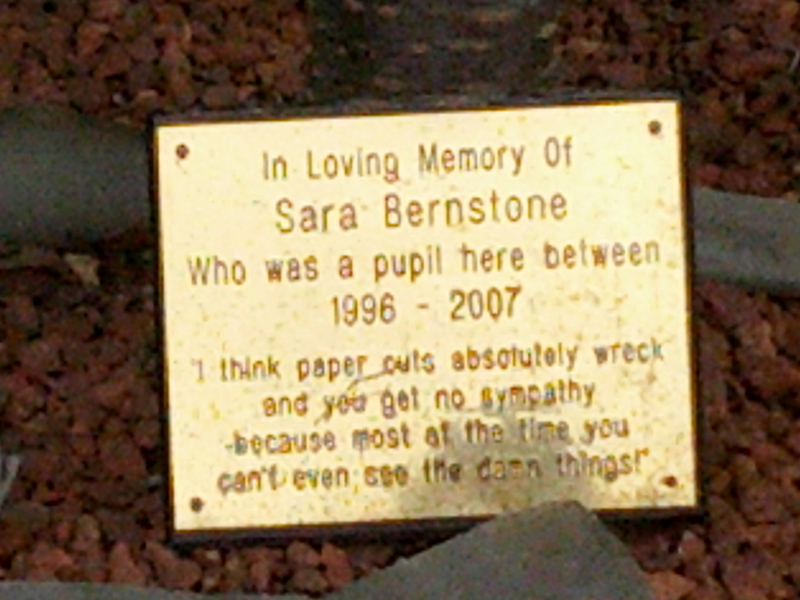 But leaving the plaque behind too? Well that left me speechless. I’ve told them and it will no doubt be reclaimed, but that’s not the point. Vergissmeinnicht? Yes, truly nightmare ground.